When thinking about the exhibition history of Irish artist Damien Flood, each individual show can be read as an exploration of a newly encountered distinctive world in a sea of worlds. In his practice, it is as if he the painter becomes an explorer of sorts, and is being pulled ashore to these distinctive worlds or islands by whatever forces of chance to carry out painterly mapping and topography of the sites. Each landing results in an exhibition of new paintings. Forms of painting emerge from these invented worlds that are clearly distinct from each other, in terms of feel, tone, terrain, and natural laws. The same forces that carried him to shore, bring him back out to sea in this archipelago of sites, until forces draw him again to another worldly mass, and the focus of his next exhibition. It is fitting then that his most recent exhibition Terra Incognita, was staged at a Harbour town, at The DLR Lexicon Gallery in Dun Laoghaire. Before this, in his first exhibition Counter Earth at the Green on Red Gallery Dublin in 2010, Flood presented paintings depicting the images from one of his first metaphysical visits to an invented and unusual world. In this, the first of six solo shows to date, we see Flood’s emerging painterly language chart the terrain and features of an indeterminate place. Familiar natural phenomena like trees, rock formations and moons are evident in some paintings, alongside more strange and indistinguishable spectacles of light and forms. Although the medium is painting, it seems the exhibition as a whole is the art-form. It binds the collective but sometimes disparate representations of spaces and forms in paintings to a singular site, a world or counter world as the title suggests. This concept becomes more obvious with each new exhibition, as the very look, feel and painterly strategies comparatively shifts from series to series. The analogy of island hopping is enforced by a work like Statis from his 2013 show Interior Sun, again exhibited at Green on Red Gallery. Pictured, is a rocky outcrop as if viewed from Flood’s passing vessel on route to his next world. By design or accident, hanging the work outside the actual gallery space, downstairs at the entrance to the building, suggested that the scene is peripheral to, but neighbouring the focus site of the main body of work upstairs. In his two most recent exhibitions Infinite Plane at Grey Noise, Dubai 2015 and Terra Incognita at The DLR Lexicon 2016, Flood shifted his approach in terms of gathering research and source materials for his work. Locations and histories related to the site of the galleries were researched through drawing, photography and text for Infinite Plane, and recorded interviews of personal stories and historical research in the case of Terra Incognita. Despite this preparatory engagement with real world sites, the physiography of the depicted worlds in these bodies of work has become significantly less distinguishable than before. Gone are the identifiable forms like trees, rock formations and moons from earlier exhibitions. The paintings still depict spaces and terrains, but the forms are becoming more and more unrecognisable as such. It is as if the currents or winds dictating his ongoing expeditions have drifted him far from where he started, into uncharted and exotic territories or deep space. Despite the lure of a depicted reality, based on photography, texts, interviews etc., Flood still chooses to move further beyond the peripheral and beyond the edge of what he knows. Perhaps the forces that draw Flood to the shores of the separate worlds he has depicted, are similar to the sensibilities of the Metamodern condition. Metamodernism is a theoretical framework that gives rise to the idea of mediation between Modernist and Postmodernist sensibilities, and is seen to be characteristic of much of today’s artistic activity. The term Metamodernism emerged as early as 1975, but disseminated more widely as a cultural theory within the field of artistic practice when Cultural theorists Timotheus Vermeulen and Robin van den Akker, proposed Metamodernism as framework to understand what they describe as, the feeling of now. In their article What is Metamodernism, they assert that the contemporary rational since the 2000s, has shifted from a postmodernist ironic and cynical one in the 80s and 90s, to incorporate a return to sincere and modernist positions. This new form of 21st century rational is described by Vermeulen and Van den Akker in relation to Plato’s idea of the metaxis, as a movement in between two sensibilities or philosophical poles. For them, Metamodernist rational embodies an in-between state of being, at once tied to Modernism’s enthusiasm and willingness to move forward, and at the same time having the distrust of Postmodern rational. The forces shaping this 21st century rational are perhaps what guide the compass of Damien Flood’s artistic practice and motives, to move forward and make choices despite the lack of evidence that there is any horizon ahead. The Metamodernist proposition as a theoretical framework appears an attractive one for painters. It allows them to navigate the familiar terrains associated with the history of the medium, but deny the naivety and utopianistic ideals associated with it. Landscape as a subject is of course one of those familiar terrains (excuse the pun) associated with the history of the medium. It’s precedence as a motif in Flood’s work is mirrored in many Irish painting practices. Landscape seems by far to have been the most practiced, exhibited and collected form of painting in Ireland, and today many established Irish painters continue to work in the tradition. This precedence seems likely to still be connected to the importance placed on landscape as a subject, which emerged from the newly formed post-colonial condition for Irish artists in the early part of the twentieth century. Also, Ireland’s identity culturally speaking, is very much aligned to it’s relationship to it’s landscape. There is a marked difference between Flood and his contemporaries, to the earlier generations of Irish painters that preceded them. The work of an earlier generations of painters like Jack B Yeats, Paul Henry and Patrick Collins through to Patrick Hall, Mary Lohan and Sean Mc Sweeney, is an art that could be viewed to be rooted in a desire to express the ideals of a celtic past. Some of today’s practitioners working within the genre, like Oliver Comerford, Gillian Lawler and Elizabeth Magill would have no such utopian aspirations, or nostalgic naivety. Like Flood and a Meta-modern sensibility, their practice’s express an urgency to go on, create and move forward, but that desire is no longer rooted in a broader sense of optimism. Elizabeth Magill, Greyscale 1, 2005. This shift in sensibility by Irish painters is a reflection of how global discourses around painting, culture, politics, society etc. have begun to dominate the conditions of practice. Most would argue that Irish painting now is not explicitly Irish, it is instead part of the wider global painting landscape. Many of the current generation of Irish painters who work similarly to Flood in terms of either approach, style, sensibility, methodology etc, seem directly and mostly influenced by developments in painting from outside the island. 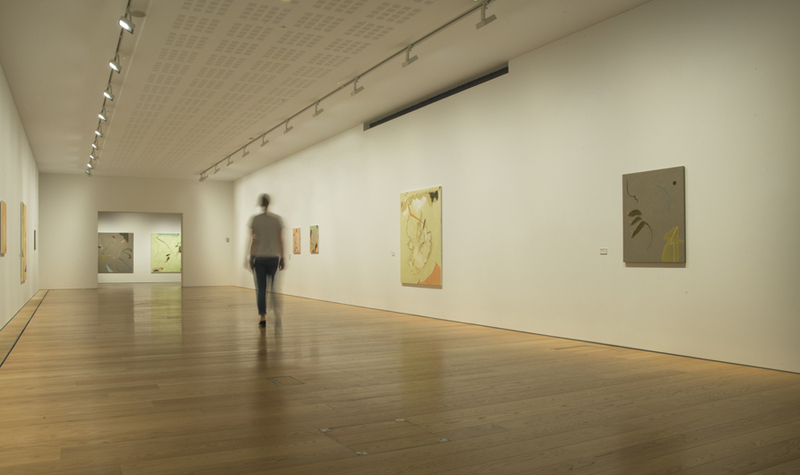 It is a small leap to make a connection between the painterly languages of figures like Luc Tuymans and Wilhelm Sasnal, on many of the current generation of Irish practitioners. And of course this is not exclusive to Ireland. Tuyman’s influence on a younger generation of painters European and worldwide, has been profound and well documented. A famous case for this, was put forward by the curator and writer Jordan Kantor in his 2004 essay The Tuymans Effect, which outlines the resonance Tuyman’s practice has had on a number of younger artists, with reference to three in particular, Wilhelm Sasnal, Eberhard Havekost and Magnes Von Plessen. But still, I would argue that because Ireland and the painting scene here is small, there is the potential for developments in the painting landscape here to emerge as a result of tribal or peer influence. The current generation of Irish Metamodernist landscape artists (if I can call them that), do certainly feel like a tribe, and a dominant one at that in the Irish painting field. The peer to peer influence in the scene does feel significantly present. Within that peer network of Irish Metamodernist landscape painters, there are figures who have influenced Irish painterly trajectories working in that mode. Robert Armstrong is a case in point. Perhaps as much for his position as the head of painting at the National College of Art and Design as for his practice, I feel a case can be made for his influence on particular models of Irish Painting. To make the case for ‘The Armstrong Effect’, it might be fitting to replace the names and a few words in extracts from Jordan Kantor’s text ‘The Tuymans Effect’ with those of Robert Armstrong and some of those practitioners working in his slipstream…..
* Changes to Jordan Kontor original text ‘The Tuymans Effect’ in Green. Emulated by scores of younger Irish artists, Robert Armstrong has become arguably the most influential Irish painter of his generation. Armstrong seems to have tapped into a particular mode of seeing and depicting that has unusual resonance. Indeed, these days one can hardly walk into a Irish gallery with an eye peeled for painting without seeing the “Armstrong effect”-the profound, if sometimes ineffable, way in which the look, subjects, and even fundamental painterly approach of Armstrong`s work has saturated a large and increasingly significant territory. Members of the next generation of painters, including some of Ireland`s most promising emerging talents, appear to have Armstrong`s spectral oils in mind as they squeeze out blobs of paint and take brush to canvas. Damien Flood’s early canvases come closest to Armstrong in overall “look” and painterly touch. This is perhaps most plainly evidenced by the similarities between a canvas like Small Valley 2009 and a work like Armstrong’s ‘A Landscape, 2007. These works share a very similar pictorial language-one that foregrounds painterly lyricism and emphasizes speedy execution. For them, a specific kind of representational shorthand reigns supreme: groups of deft brushstrokes can stand for “Mountains or trees”, while abstract, almost formless blotches, spills and smears read as the envelope of atmosphere surrounding the worlds depicted. If Flood`s art can be read through Armstrong in such general stylistic terms, Another Irish painter Sinéad Ní Mhaonaigh`s relationship to the senior figure has more to do with the nuts and bolts of painting. Canvases like ‘Untitled,’ 2012, for example, are very similar in pictorial construction to those of Armstrong, and not simply because she employs painterly choreography in many of the same ways. Instead, their affinity is strongest at the level of technique and form, especially in their straightforward compositions and paint-handling and their sometimes aggressive engagement of the viewer. Artist, Ciaran Murphy, has a more metaphysical kinship to Armstrong. His art shares less a specific “look” than a particular model of visuality based on pictorial ambiguity. Murphy’s recent work treads a thin line between abstraction and figuration, or, perhaps more precisely, between generality and specificity. In both Murphy’s, Highway kind, 2013, and Armstrong`s, Peruzzi, 2009, the primary visual tension in the picture is between the depiction of deep space through the use of perspectival rendering and the refusal of that space by the overt display of its painterly construction. Murphy pushes that abstraction even further than Armstong, creating an almost completely illegible image. Ciaran Murphy, Highway kind, 2013 .